There are very few things that annoy me about wargaming. But one thing gets right up my nose. It's this method of measuring a wargames figure only to it's eye level. This causes the most controversey and debate in the popular 25mm size of figures. Not everyone subscribes to it, me included. I mean, think about it...do you or anyone you know measure themselves up to the eyeballs and then go around saying that's how tall they are? No of course not. But, the people who do subscribe to this small lunacy try to push it constantly on forums whenever they get the chance, because they want to impose a "standard" on everyone else. They especially like to jump on the chance to indoctrinate a newbie. So the poor guy (or girl) gets a load of conflicting advice and of course, the only real way to determine how big is a miniature is eventually to buy a sample or two. Also, while we are on the subject....the often discussed "true 25mm" is actually 1/72. An average 5 foot 10 inch man (70 inches) or in metric, 1778mm to the top of his head. Agreed? But, of course in the crazy world of wargaming we call everything from 1/87 to 1/72 "20mm"
I am always a bit flippant about scales, so long as the figures look like the belong to ROUGHLY the same species. It becomes much more important when you get to WW2. When we used to play a lot of Crossfire I bought a couple of vehicles, while Tim who had the Ruskies bought tons. 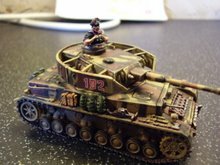 The were all 1/76th except for my Hetzer which was 1/72. Not a problem I thought until we got it onto the table and found it was almost as big as a JSU152! I still used it as I love Hetzers, but was always aware of how huge it was. My own "20mm" collection is ruthlessly 1/72. I also go for the larger end of the 20mm figure range such as Raventhorpe and Chiltern to fit in with my vehicles. When I play with my mate Paul the difference in size (his are all 1/76) is very obvious. Welcome to my hobby blog. This is where I hide from the real world.